Closing Day for all of our Community Gardens is Saturday, October 21st. This said, it's not over yet! Closing Day doesn't mean that you are evicted from your plot. You are more than welcome to extend your garden season further into fall. Many of your greens and other fall crops tolerate cold temps, and we would love to see you eating out of your garden as long as possible! However, areas of your garden that are no longer producing, weeds, and expired plants should be cleaned up. By tidying up at the end of the season, you can help keep pests and weeds down, your neighbors happy and your deposit back in your pocket by the end of the year. Follow these five easy steps below to ensure your plot is put to bed properly by October 21st. Also, mark your calendars for our final workshop of the season: "Putting It to Bed: Plant Garlic, Build Your Soil and Plan for Next Year" at the Northside Community Garden on Tuesday, October 10th from 5:30pm - 6:30pm. 1. Remove or turn in all non-perennial and non-producing plants, weeds, roots, and debris in your plot. Place weeds in the weed pile. Place stalky materials (corn, sunflower, broccoli, kale and other brassicas) in the stalk pile. All other plant material (including leaves torn off stalks) can be placed in the house compost pile. You can also chop and break up organic material including leaves, plants, or compost into your plot to help build your soil. 2. Remove all trash and miscellaneous items from your plot. Please leave your plot tidy for the winter by removing all trash, debris, trellising materials, plastic containers, etc. We want our gardens to look nice for the neighboring community, passersby, and all of our generous partners who let us garden on their land. You may leave perennials and late season crops in your plot as long as they are trimmed and tidy. As soon as you are done harvesting your late season crops they must be removed. Please don’t leave a bunch of rotting plants standing throughout the winter. 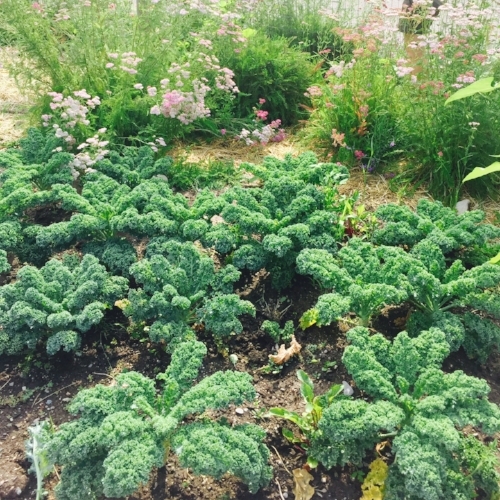 The perennial flower yarrow and late season crops like kale can stay in your plot after Closing Day as long as it is tidy. 4. Weed the paths around your garden (and mulch, where applicable). All weeds, including roots, should be pulled from the north and west pathways of your plot and placed in the weed pile. At sites where woodchips or sawdust is provided cover your weeded pathways with a 2-3 inch layer of woody mulch. 5. Cover your plot with a layer of straw mulch (use ½ bale per plot). Use a half bale of straw to cover your plot. This helps it retain moisture over the winter and keeps it looking clean. Tip: Water down the straw after you cover your plot so it doesn't blow away. 6. Compost will be delivered next spring. In the past we have delivered compost in the fall to overwinter in the plots. We are now getting compost that does not need to overwinter. Garden City Harvest will provide compost on Opening Day next year. That being said, why wait until next year? Feel free to incorporate your own compost, leaves, or other organic matter into the soil this fall, and it will break down over the winter. Make sure all materials come from an organic source and are thoroughly broken down to small pieces. Are you a Garden City Harvest Community Gardener, please help us improve this program by filling out the End-of-Season Survey! Check your email or click here. If you'd like a paper copy, look in the garden sheds or stop by our office. Your feedback helps improve the program, secure grants and gives us a better understanding of what our gardens mean for our gardeners! 7. Enjoy your harvest, relax, and make notes about what worked and what didn't, so you're ready for next year!